With the user pool growing by over 20 per cent, month, by month and 250 of Australia’s largest employers on board, TalentVine Founder and Managing Director, Justin Falk, has been on the hunt for his own best candidates. 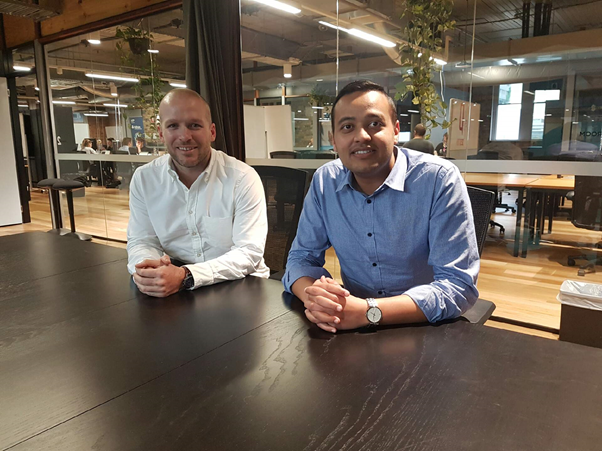 He attended Ribit’s August speed networking event, ‘Student Connect for Jobs’ at innovation hub, The Capital, with a view to hiring more technical talent, bringing along his CTO, Tex Andersen, as a recruiter wingman. The two hour event saw Justin and Tex meet an array of talented university students. “I went along looking for technical talent and was incredibly impressed with the quality people who came through”, Justin said. Student attendee, Arslan Nizami, had just completed his Masters in Electronics and Energy Engineering from Griffith University and had never previously explored Brisbane’s startup scene. “The Ribit event was a fantastic experience. The businesses weren’t window shopping, they were there to find talent”, Arslan said. He was immediately intrigued by Justin’s presentation as part of the employer pitch session held at the start of the evening and proved an immediate hit when he dropped by TalentVine’s table. “Straight away I was impressed by Arslan’s knowledge of TalentVine, his communication style, previous experience and how he pitched himself. I could picture him working with clients”, Justin said. Within less than a week, Arslan had secured a business development internship. “My Masters has really come in handy for such a role”, says Arslan. He immediately transferred these insights to TalentVine’s operations and growth. “On his first day we started implementing suggestions he made to the platform”, said Justin. “Arslan’s engineering background really comes in handy. As well as creating new clients and keeping existing ones happy, he’s developing all our internal structures and procedures. “The main aim for startups is to get traction, and it’s important to find interns who have the skills and experience to hit the ground running”.